Happy Halloween! Since it is Halloween, I have got to keep the pumpkin recipes going and what a perfect time to make a delicious pumpkin pie! 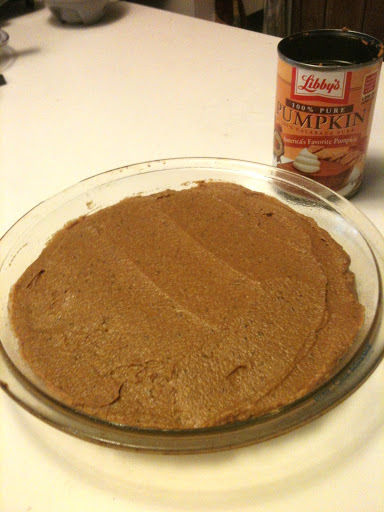 Since I do not eat a lot pretty much all of the typical Halloween candy, I figured I should make a pumpkin pie. 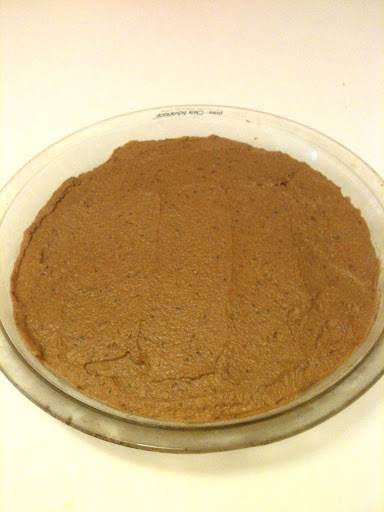 A no-bake, vegan, gluten free one of course! Plus, I had to try out this recipe before Thanksgiving because I wanted to make it again for Thanksgiving if it was a success. 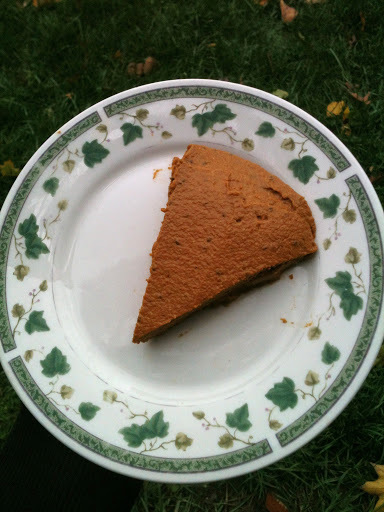 I am so happy it was, because this pie is filled with healthy omega-3’s, vitamin A, and fiber. Super easy to make, just mix everything in a blender. Which means super easy to clean up, just the blender and a few measuring spoons. You don’t have to stay at home waiting for it to bake, just put it in the fridge and you can run errands outside the house. To make the crust, mix together all ingredients in a food processor until well blended and mixture holds together. Press crust into a greased pie pan and set aside. 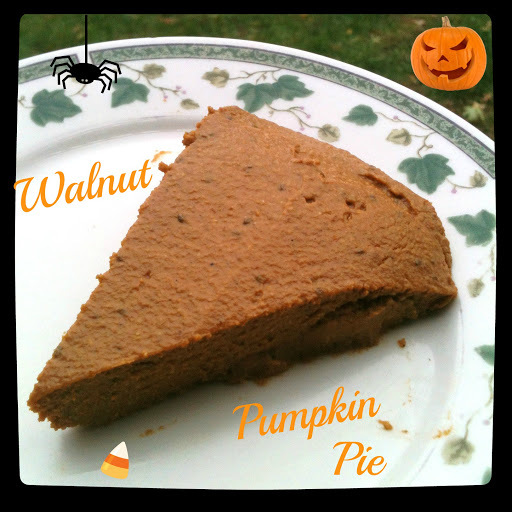 In a blender, combine pumpkin, coconut sugar, walnuts, salt, and pumpkin pie spice. Blend until smooth and creamy. Add in the almond milk and chia seed mixture. Blend until incorporated. Blend until everything is combined. You may need to scrape down the sides of the blender as needed. Pour filling into prepared pie pan. Smooth the filling with a spatula so it is smooth and even. Walnut Pumpkin Pie before slicing! This pie tasted so good! What a great treat to celebrate with on Halloween! 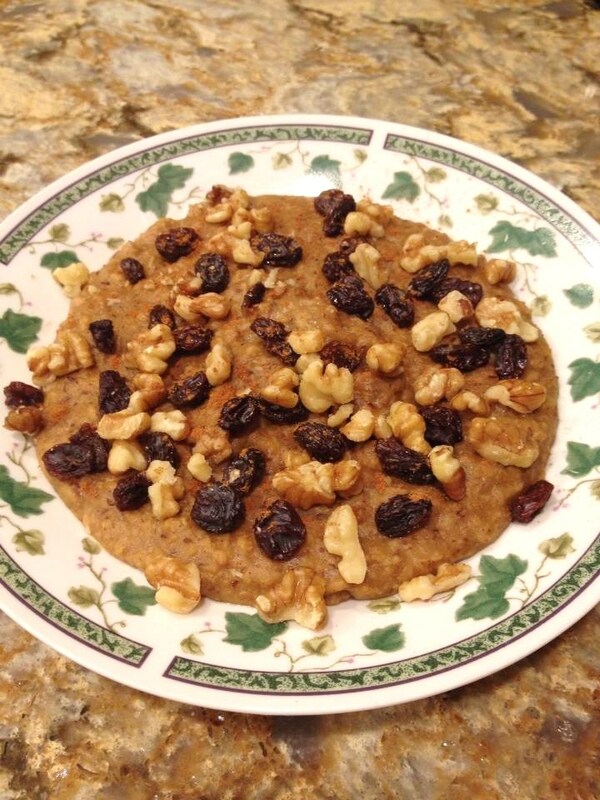 1 slice with no crust this recipe yields approximately 228 calories and 2.5g protein. 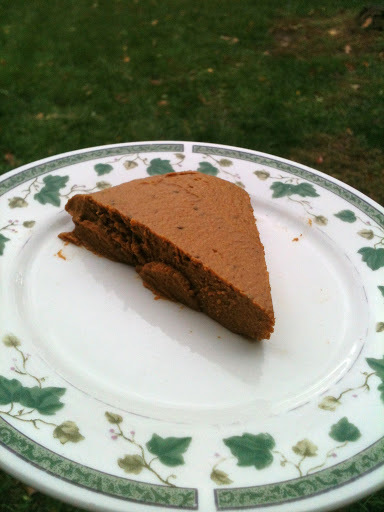 1 slice with crust this recipe yields approximately 298 calories and 4g protein. Yesterday was National Oatmeal Day! OMG I love oats! I love how once you cook your oats you have a wide variety of flavor options by adding different fruits and toppings each time. I could never get bored of having oatmeal every day for breakfast just because of this reason. In the summer I really started to eat them after hearing about Overnight Oats. I loved that I could prepare them the night before and in the morning breakfast was already waiting for me. Also, by sitting overnight, the oats really soaked in the almond milk so that the oatmeal was quite voluminous. Now that the weather is cooler, I have been enjoying a warm bowl of oats in the morning. I still prepare the oats the night before to save time (especially on work days) and to continue to allow the oats to soak in the almond milk for extra volume. In the mornings, I quickly reheat it in the microwave while preparing a hot cup of coffee. Even though this oatmeal post is a day late for National Oatmeal Day, I still ate oatmeal for breakfast yesterday morning. Though the recipe I’m sharing is not the bowl of oatmeal I ate yesterday. Yesterday’s bowl was just oatmeal with dark cocoa powder and a banana. This recipe is a new idea on how to add more volume and protein to your breakfast and kept me fuller longer. It’s a genius idea. Combine all ingredients, except walnuts and raisins (if using), in a medium sauce pan and bring to a boil. Lower heat and allow to simmer for about 10 minutes. 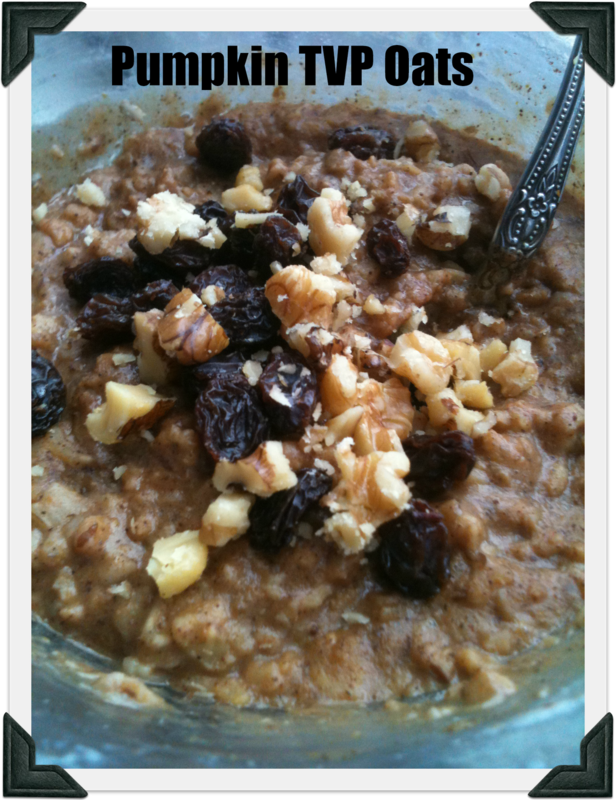 Pour into a bowl and if desired, top with walnuts and raisins! Extra cinnamon also goes very nicely on top! If you are short on time, this can be made in the microwave, although it won’t be as creamy and the TVP may be more chewy. 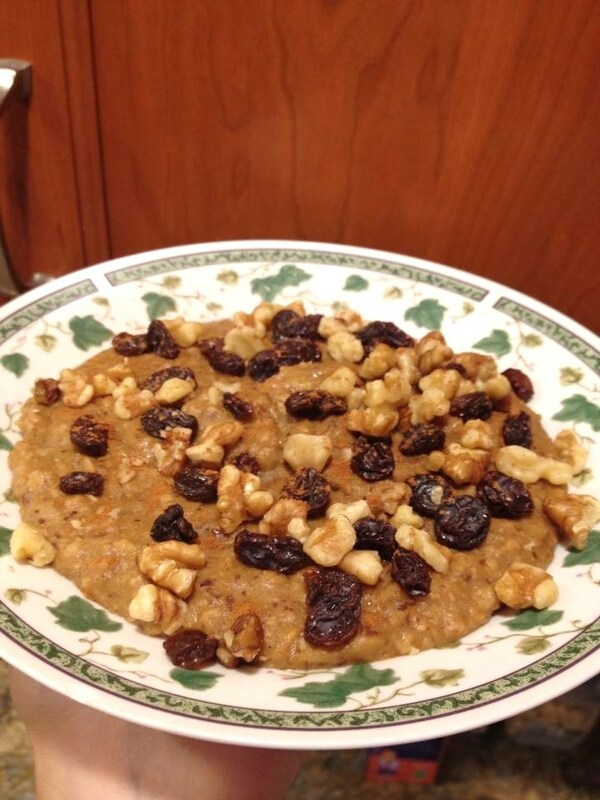 All you have to do is combine all the ingredients in a microwave safe bowl, except walnuts and raisins (if using). Microwave for 2 minutes, stir, then microwave for another minute or until all the liquid is absorbed. Make sure to watch closely so it does not overflow. I can’t wait to try other flavor varieties using TVP as “oatmeal”. It’s a great way to get a great amount of protein first thing in the morning! This recipe yields approximately 315 calories and 21g protein. 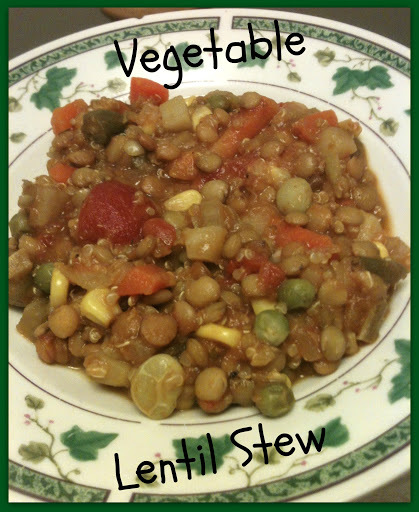 This Monday the letter for Meatless Monday’s from A to Z begins with L for Lentils. Surprisingly, I have never cooked with lentils before. I always found that if I wanted beans it was easier to grab a can of chickpeas or black beans that just needed to be heated or just grab a can of pre-made lentil soup (like I did Saturday night for dinner.) This really is not an excuse to not cook lentils since all that is required is tossing some lentils with water in a pan and letting them cook for 30-40 minutes. What could be more difficult? 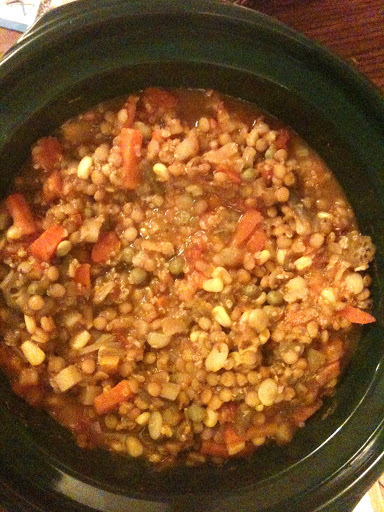 However, with this recipe I still cheated because I did not pre-cook the lentils. I simply tossed them into a crock pot to make this soup. I’m still without a kitchen and needed something easy and not time consuming. Plus, I wanted dinner ready for me when I came home. Combine all ingredients in a crock pot. Stir to combine everything together. Allow to cook for approximately 6-8 hours. To make this even more simple you can use onion flakes and minced garlic (the kind you keep in the fridge). Just follow the directions on the containers to add the appropriate amounts. 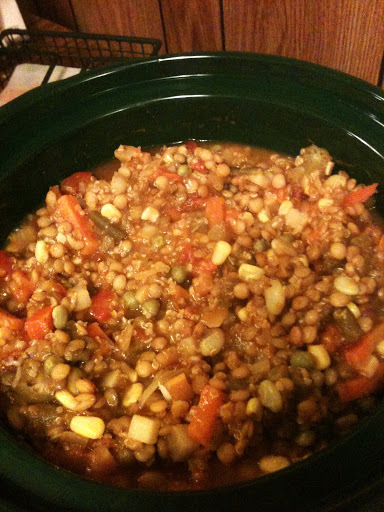 You can also precook the lentils if you want them to be softer. If you want to (and have that luxurious time) you can can buy fresh vegetables to chop. I also like more spice so I added some Sriracha sauce to my own bowl of stew. One thing I really like about this stew is you can buy different types of frozen vegetables each time to have a different variety of stew! I am roughly estimating that this recipe yields 12 cups. I love nut butter! I love bananas! I love them combined together! I love creative ways to eat them! And I love giving the snack a fun name! This isn’t really a recipe, just a great idea I had to quickly and easily eat a banana with nut butter. All you do is unpeel a banana. 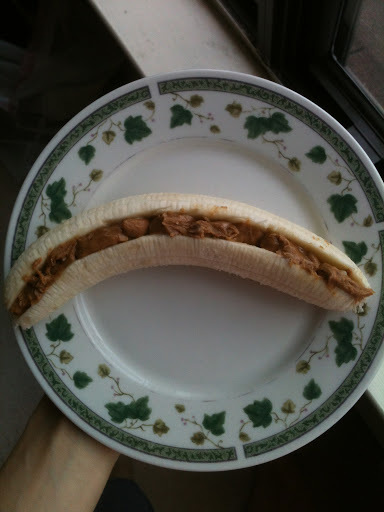 Then, drag a knife through the banana lengthwise to carve out the middle to hold the nut butter like a taco holds its fillings. Now add your favorite nut butter: peanut butter, almond butter, cashew butter, walnut butter, pecan butter, sunflower seed butter, pumpkin seed butter, etc. Or make a combination! I once added chocolate peanut butter (love PB&Co. brand) to half the banana and the other half had sunflower seed butter! This was a huge banana with crunchy peanut butter! 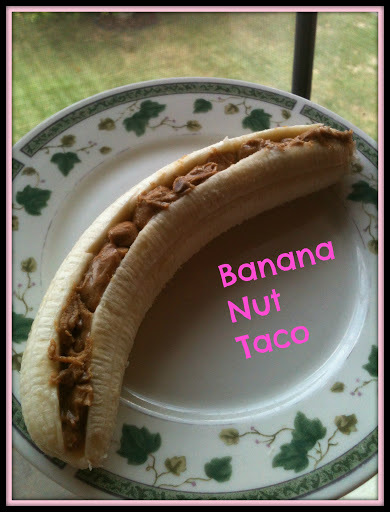 Lately, I have been adding almond butter and the “filling” is overflowing the banana! I seriously eat this snack like it’s my job! Yesterday was Meatless Monday from A to Z with this Monday’s letter as K for kale. 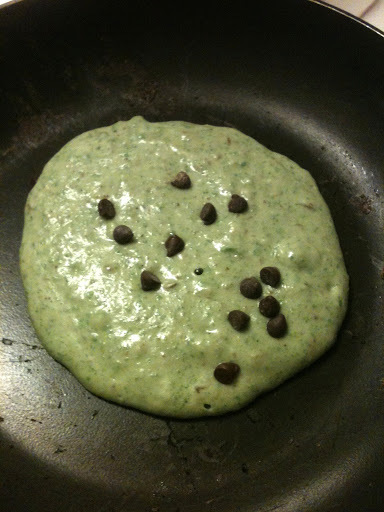 For my kale recipe I made Mint Chocolate Chip Pancakes. Since I had lots of leftover kale I decided to try another new breakfast recipe with kale. This was like eating a green smoothie in a bowl! 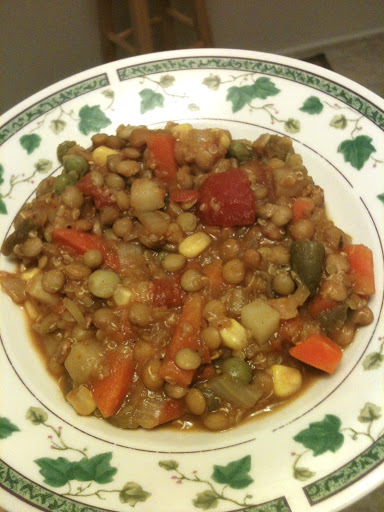 This recipe was adapted from Healthful Pursuit. I made a few changes to the original recipe. In a blender, combine yogurt, banana, kale, flax seeds, and lemon juice. Blend until smooth and creamy. 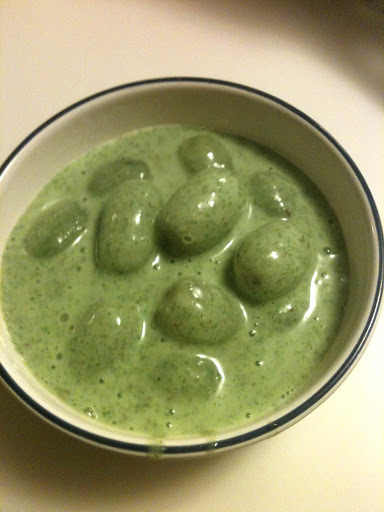 Put grapes in a serving bowl and pour smoothie batter on top. This week we are on the letter K for Meatless Mondays from A to Z and K is for Kale. I love kale and use it all the time. Usually, I saute it on the stove top with some balsamic vinegar and red wine vinegar and add some nutritional yeast, and maybe some garlic and onion powder. Then, I eat it either straight from the pan as a side dish or maybe mix in some chickpeas and/or tempeh to make it more of a meal. I also add kale to smoothies a lot. So this week I wanted to try something different. I decided to add kale to my pancakes! This is actually something I have been meaning to do since the summer, except using spinach instead of kale, which of course works too! In fact, the original recipe calls for spinach. Feel free to try this recipe with kale or spinach, I personally think kale has a bolder flavor though so if you are hesitant in adding greens into your pancakes you may want to try the spinach first. 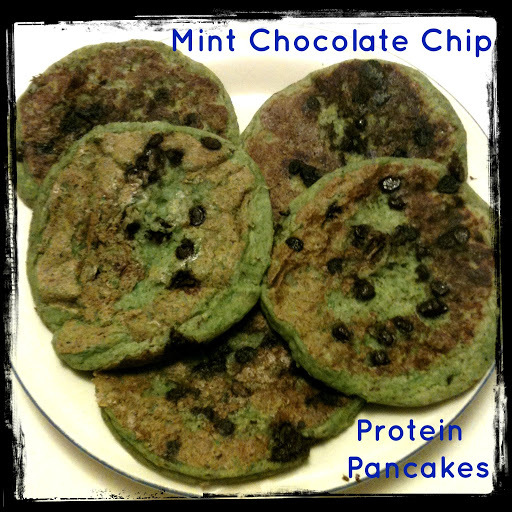 I know green pancakes might not look the most appetizing, but trust me these are delicious! 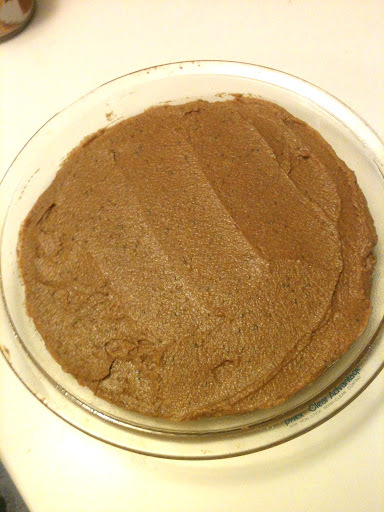 In a medium bowl, combine bisquick, protein powder, and baking powder and whisk together. In a blender, add 1/4 cup almond milk, kale, vanilla extract, and the mint extract. Process until the kale has broken down. Pour batter by 1/4 cup onto a hot griddle over medium-low heat. Add a few chocolate chips to the top of each pancake and cook until lightly golden on each side. *You can use whole-wheat flour or a GF flour instead of the bisquick. You can also omit the protein powder, if desired, but then increase the bisquick or flour to 1/3 cup.With this recipe, I was able to make 5 medium-sized pancakes. I wish they stayed this green instead of turning golden brown when cooking. I loved the minty taste and the sweet chocolate! Topped with pure maple syrup, these made a very tasty breakfast. Not only are they tasty, but they are packed with protein, and the kale adds tons of vitamins A and C! 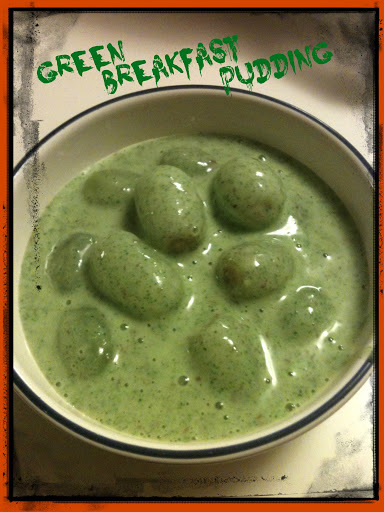 What a great way to start the morning!For another green breakfast with kale, check out this Green Breakfast Pudding! Update: I recently made these Mint Chocolate Chip Protein Pancakes as waffles!!! 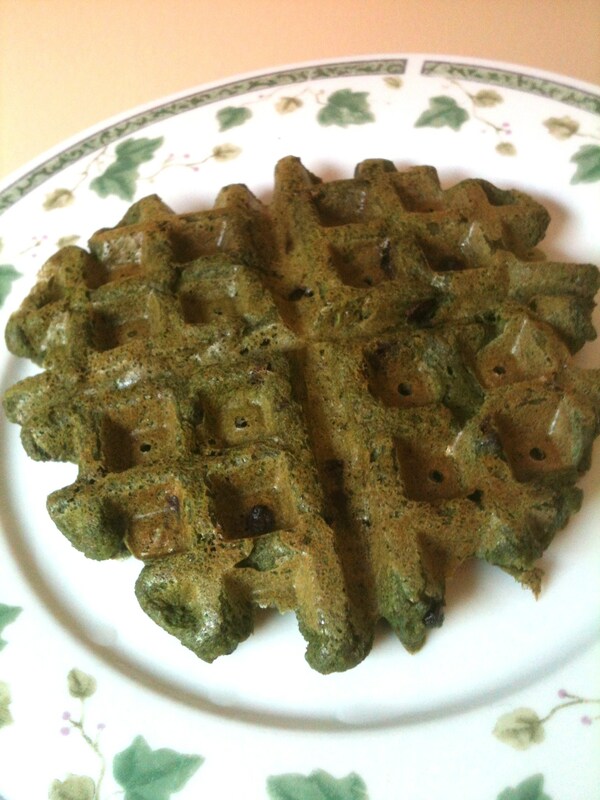 I followed the exact same recipe, except instead of using GF Bisquick, I used buckwheat flour and I used spinach instead of kale. Once the batter was prepared, I just poured it into my waffle maker and made 2 medium sized waffles! It was so much easier to make these as waffles instead of pancakes since the waffle maker cooks them for you and you don’t have to worry about doing any flipping. Based on using buckwheat flour instead of GF Bisquick, the entire recipe for the waffles yields approximately 357 calories and 25g protein. 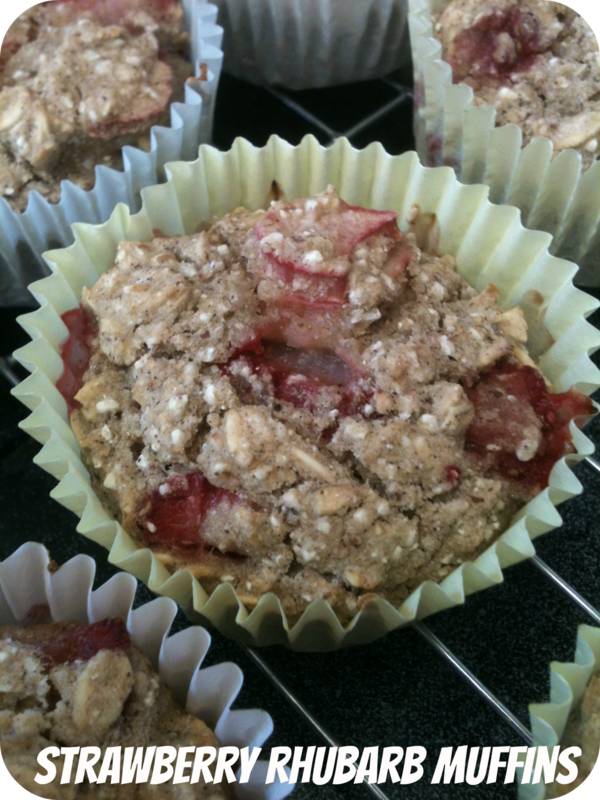 I haven’t posted a sweet treat recipe in awhile so thought these Strawberry Rhubarb Muffins would be perfect! 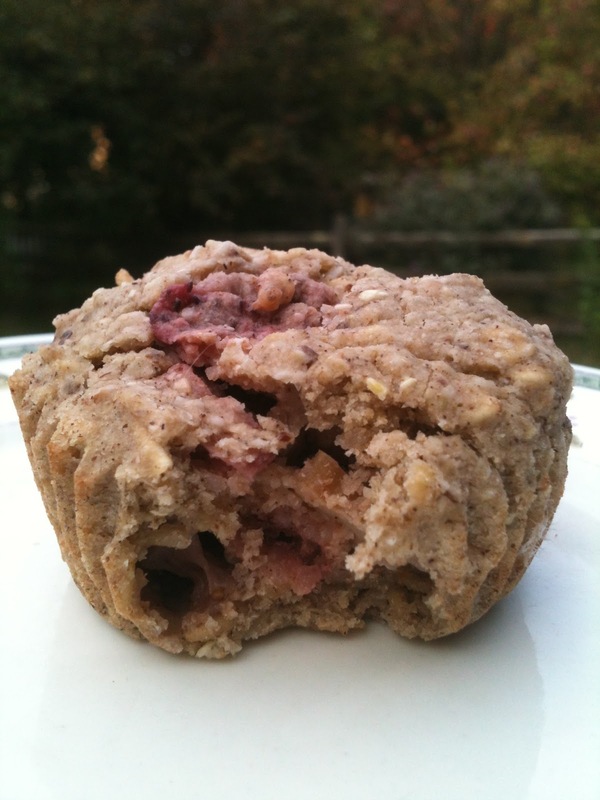 These muffins make a great breakfast, snack, or a guilt-free treat at the end of a long day. 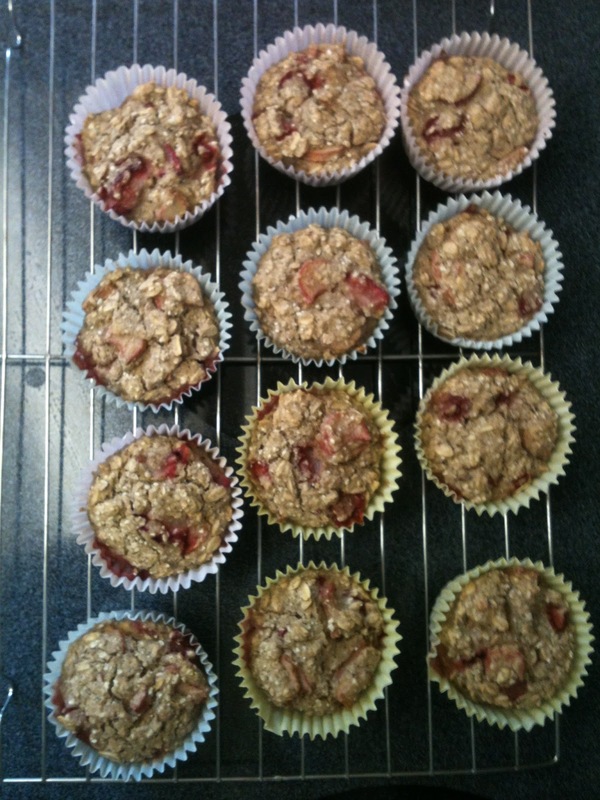 You can also try crumbling them on top of a yogurt bowl , on top of warm oatmeal, or simply add some fresh strawberry jam on top of a muffin for another variation! Preheat oven to 425F and line a muffin tin with cupcake liners. In a large bowl, whisk together the flours, sugar, baking powder, salt, and cinnamon. Gently fold in the flax egg, milk, and oil until just combined. Gently stir in rhubarb and strawberries. 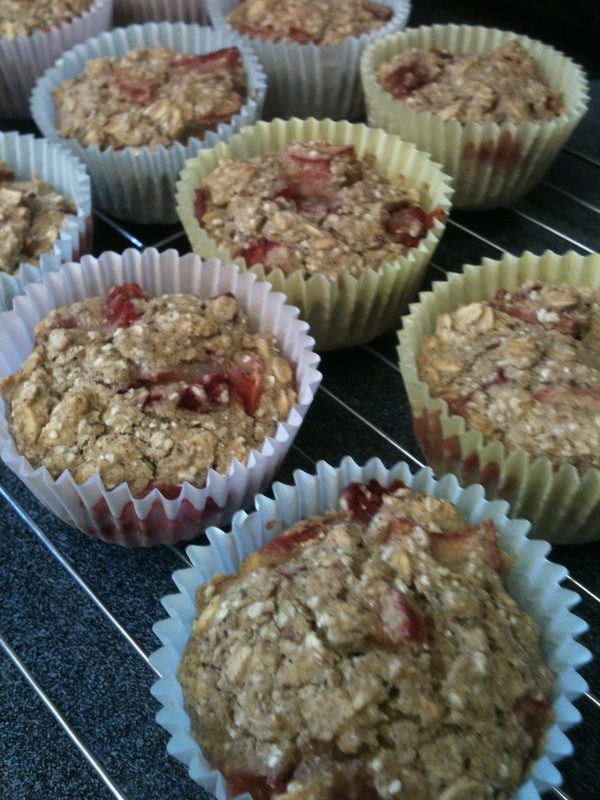 Pour into prepared muffin tin and and bake for approximately 15 minutes. 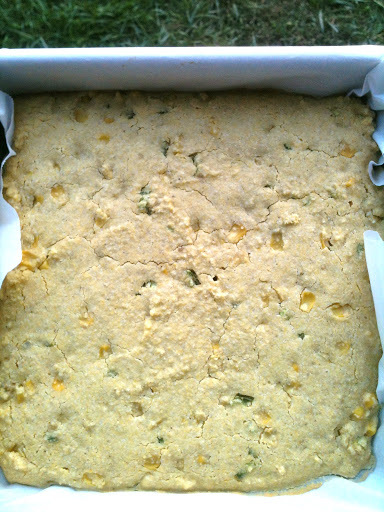 Yesterday, I posted a recipe for Jalapeno Cornbread. If (like me) you have leftover cornbread, here is another great meal to pair with the cornbread. Basically, I was in the mood to make some tofu and wanted to try something new instead of using my typical marinade when I bake tofu or tempeh. I found a recipe with some different marinade ingredients and it was very tasty! Press tofu to remove all excess liquid. Cut into cubes and freeze overnight, if desired. Combine all marinade ingredients in a container and place tofu in the marinade making sure all pieces are covered. Place lid on container and put in the fridge for at least one hour. Preheat oven to 375F and line a baking sheet with foil. Place tofu on the baking sheet and bake for 20 minutes. After 20 minutes toss the tofu pieces, spoon some extra marinade on top, and continue baking for another 10 minutes or longer depending on how you want the texture of your tofu. For extra chewiness, place under the broiler for about 3 more minutes. 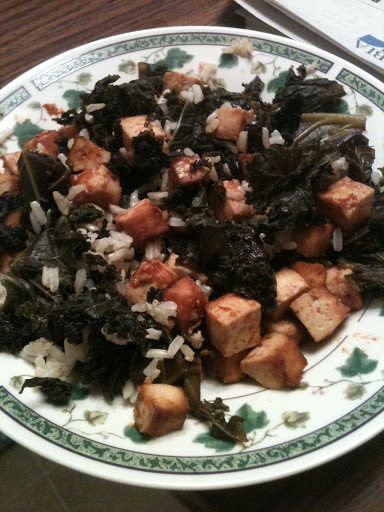 After I baked my tofu, I served it atop of brown rice and kale that was made with balsamic vinegar, red wine vinegar, and nutritional yeast! This week’s Meatless Mondays from A to Z begins with the letter J and was made with the ingredient Jalapenos! I have never used jalapenos to cook with before so was excited to give this ingredient a try. The most typical recipe to make with jalapenos is probably a salsa, hummus, or maybe even some kind of chili. For my recipe, I had just remembered looking through the Everyday Happy Herbivore cookbook and seeing a recipe for jalapeno cornbread. Ooh, cornbread sounded delicious and since I still do not have a kitchen I knew this cornbread would pair well with an easy crockpot chili, my Hominy Chili that I made two weeks ago! Preheat oven to 400F and line an 8×8″ baking pan with parchment paper. In a medium bowl, combine cornmeal, flour, baking powder, and sea salt and whisk together. Add almond milk, applesauce, and agave and gently stir to incorporate all ingredients together. With a spatula, gently fold in the corn and jalapeno until everything is just combined. Pour into your prepared pan and bake for about 20-25 minutes or until a toothpick inserted in the center comes out clean. 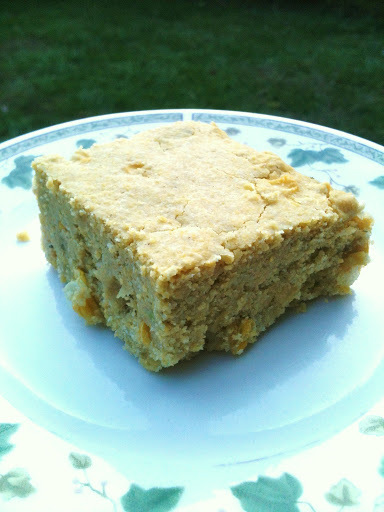 You could also try a different flour to give this cornbread a slightly different taste. Just keep the total amount of grains at 2 cups and you’re cornbread should turn out great!If you want a sweeter cornbread, try adding about 2 tablespoons of raw sugar. I didn’t think I would like a sweeter cornbread so I did not add it originally, but I am definitely going to add it next time. I think the extra sweetness will really help bring out the flavor. 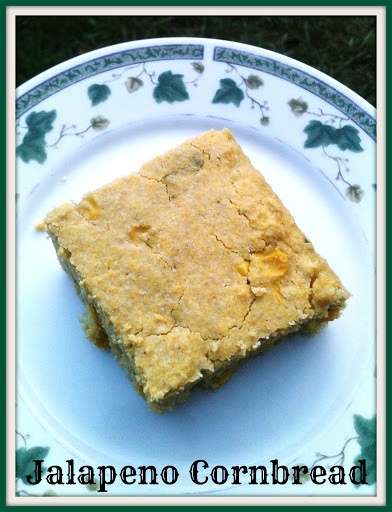 Enjoy this cornbread as a snack, or serve it alongside some warm chili, stew, or soup during these cooler fall monthsThis recipe yields 9 squares. 1 square yields approximately 140 calories and 2g protein. 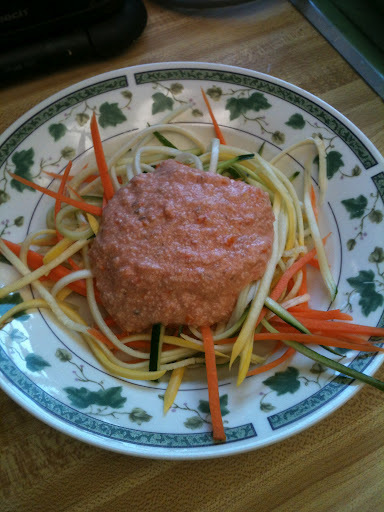 This sauce is very fresh tasting and tastes great over regular cooked pasta or veggie noodles (spiralized veggies). 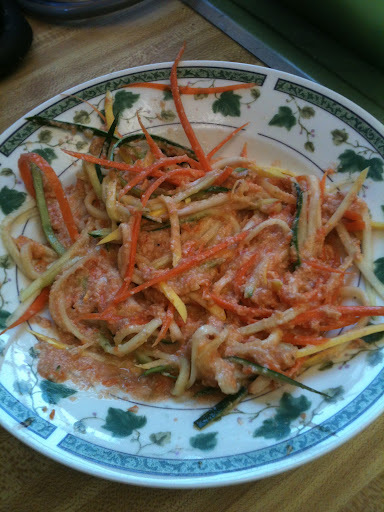 I used a julienne peeler to make my veggie noodles out of squash, zucchini and carrots. Combine the tomatoes, cashews, garlic, date, and wine vinegar in a blender and process until smooth. Taste the sauce once it is smooth and add pepper and adjust seasonings to taste. Serve over hot pasta or cold veggie noodles. 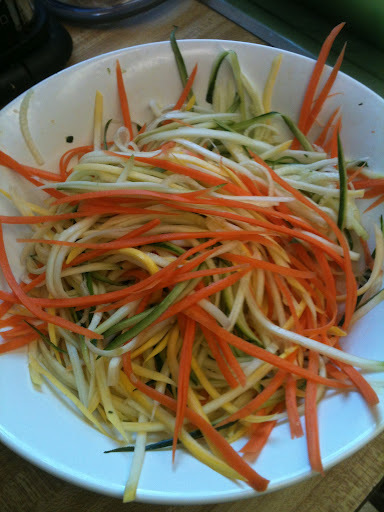 Veggie noodles before adding sauce. 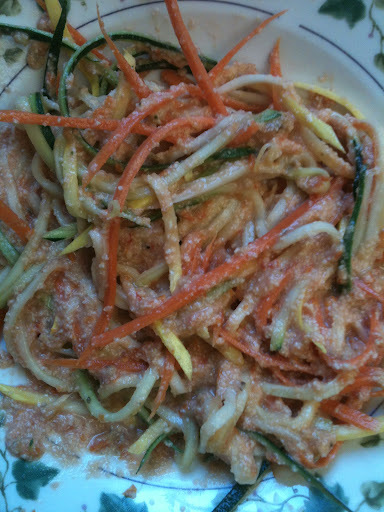 Veggie noodles with sauce before stirring. This sauce is best the day it is made. I love how this sauce is extremely simple to make and only the blender needs to be cleaned afterwards.